people of color | The Intraracial Colorism Project, Inc. The following survey titled “Multiracial Identity in the Millennium” is being conducted by The Intraracial Colorism Project, Inc. 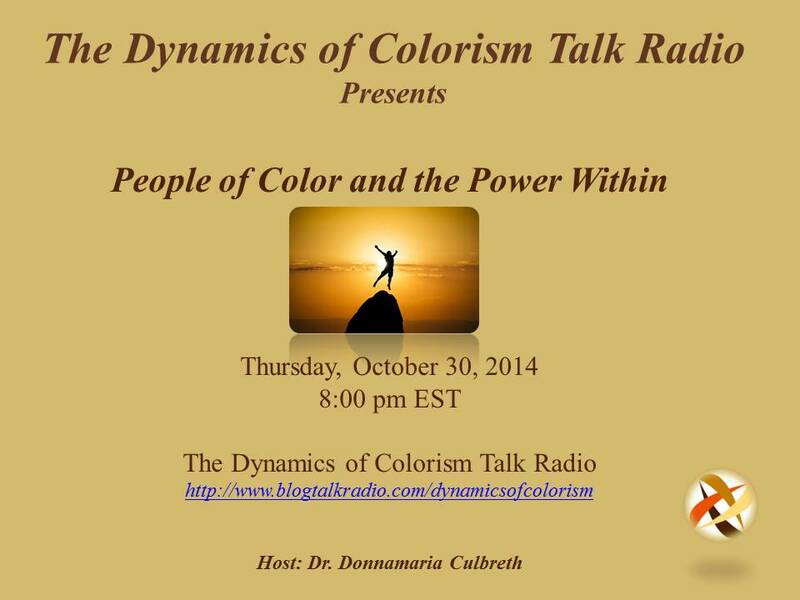 The results of the study will be shared live on the air on The Dynamics of Colorism Talk Radio. The survey consists of 50 questions focused on multiracial people of color and identity issues. The term multiracial is used to describe people of mixed race and biracial heritage. Participants must be 18 years of age and older and of multiracial heritage. If you are interested in participating in this survey and are under 18 years of age, you are required to obtain the consent of your parent or legal guardian before completing the survey. You will be asked to answer 50 survey questions anonymously. The questions pertain to personal demographic information, skin color, and identity concerns of multiracial people of color. There are no known risks associated with participating in this anonymous survey. The following is a link to the National Register of Health Service Providers in Psychology: www.nationalregister.org. In the event that you would like to talk about any issues, you can use the above link to find a doctor in your area. The People of Color Skin Color Identification Chart (POCSCIC) consists of Light, Medium and Dark skin colors. Colors will vary depending on the screen resolution/monitor. The Survey will take approximately 15 minutes to complete and must be completed at one time. You will not be able to return to a partially completed questionnaire. By proceeding to the survey questions, you agree that you have read and understand this information and agree to participate.